The STWS Yoga by Donation program is now in 42 studios in the Metro NY area. We now offer over a thousand classes by donation to people affected by 9/11 and Sandy as well as members of the armed forces and veterans. 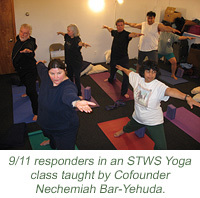 Serving Those Who Serve, Inc. (STWS) is a nonprofit organization dedicated to the health and well-being of people affected by 9/11, Hurricane Sandy, the BP Oil Spill in the Gulf, as well as armed forces personnel and veterans by offering them holistic and integrative healing modalities. Over 2700 people affected by 9/11 have gone through our programs, including over 1200 members of the FDNY and 400 veterans and armed forces active duty personnel. Our goal is to assist in the healing process of the 9/11 community, the Gulf of Mexico community, those affected by Hurricane Sandy, and armed forces personnel and veterans who are struggling with health issues because of exposure to severe stress, environmental toxins, or manmade or natural disasters. STWS' work began in 2002 serving both 9/11 first responders who served at Ground Zero and related sites and area workers and residents. Eleven and a half years after 9/11, tens of thousands of people are still sick and many more are at risk. Many people exposed to the toxins present when the World Trade Center was destroyed are still experiencing respiratory problems, as well as memory loss, inability to focus, fatigue, anxiety and even depression because of exposure to heavy metals and other toxins at Ground Zero. Perhaps many more suffer from Trauma and PTSD. Many of these same health challenges are being experienced by veterans, active duty members of the armed forces and people affected by the BP oil spill in the Gulf and Hurricane Sandy. More and more information continues to surface about the long-term health risks from the resulting exposure at the 9/11 sites, the BP oil spill and exposure to combat. One of our programs are Breathwork and Meditation workshops taught by world-renowned Integrative Psychiatrist Dr. Richard Brown. These workshops have been offered to members of the 9/11 community, people affected by the BP oil spill, Hurricane Sandy, armed forces personnel and veterans. There are many studies in peer-reviewed journals that show that breathwork and meditation can have dramatic results to help people heal from the worse kinds of trauma, including natural and man-made disasters. Another program is herbal formulas from the distinguished US-based Ayurvedic company Banyan Botanicals. The herbs are listed as dietary supplements by the FDA. The STWS herbal program consists of four herbal supplements that can be safely integrated with a participant's current health protocol. These herbal formulas gently detoxify the body and build up the immune system. 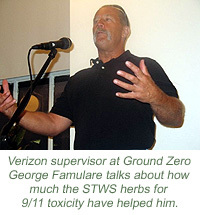 Most of the 9/11 responders and people affected by the BP oil spill who have taken the herbal formulas for the recommended minimum of 6 months report relief from the symptoms of 9/11 and BP oil spill illnesses. These health improvements are often dramatic. Our other programs include Yoga by Donation, acupuncture for stress, reflexology and stress management workshops. To learn more about the STWS herbal program and to sign up for it please click here.